Below is a blog post that I started writing earlier this year, but I kept putting it off from finishing the post. Here it is below with a photo of my kittified room half done. It's that time to start anew. Every time that we start a new year, I think of a new beginning. A time to start afresh and welcome the new spring. My new year consists of completing my room transformation project. From an ordinary and average room to a theme oriented room. I wanted what I saw in the mobile app, Line Play's kittified cartoon room. For these past few months, I have been waiting patiently for the last final touch that will complete my Makeover Project. It's been a two year long project that seemed like it would last forever. 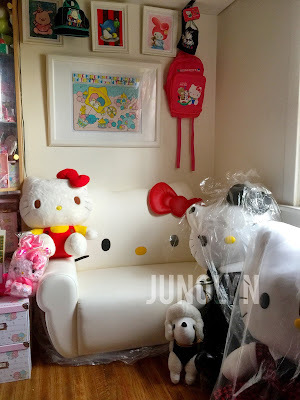 Now, I can say that I have succeeded in all my makeover plans because I have achieved the ultimate wish any collector can dream about... a Hello Kitty sofa. Not just any ordinary sofa that we're talking about here: a glorified Hello Kitty shaped sofa made for adult size. Not the kind of sofa where they sticked a Hello Kitty face on it and pass it off as the real deal. Also, a special custom made sofa that can only be bought from Japan and nowhere else. Imported all the way from Japan, my Hello Kitty sofa is another continuation of my Sanrio journey. My Hello Kitty sofa is a game changer for my Makeover plan. I could get by without the sofa and have displayed all my other coveted collections, but this sofa changes the playing field. This sofa is the coup de grace. In order to emphasize a theme, you would need something out of ordinary to achieve the best result. What better way to do it than a Hello Kitty sofa? It's big, pretty to look at, pearly white new, and best of all-- you can't buy it locally. It's not something an average person could go out of his or her way to get. As the months have passed with me owning this gem of a sofa, I feel like I am stuck in an ongoing dream. A dream filled with happiness and cuteness that surrounds me on a daily basis. A dream that started when I became a serious full time collector. I wanted to see if I could transform my home without making an average person think that it was only a kid's bedroom or themed home. 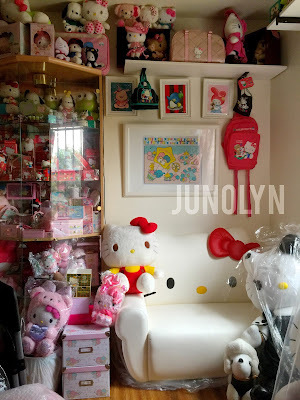 I wanted to prove that Sanrio decor can still achieve that cool effect. To prove that Hello Kity isn't just for kids anymore. It can also be for adults. So, world-- embrace us, adult collectors, because we're not going anywhere.